Gains in Milk Protein Prices Drive the Class III Milk Price Up. The August Class and Components prices were announced on September 5. 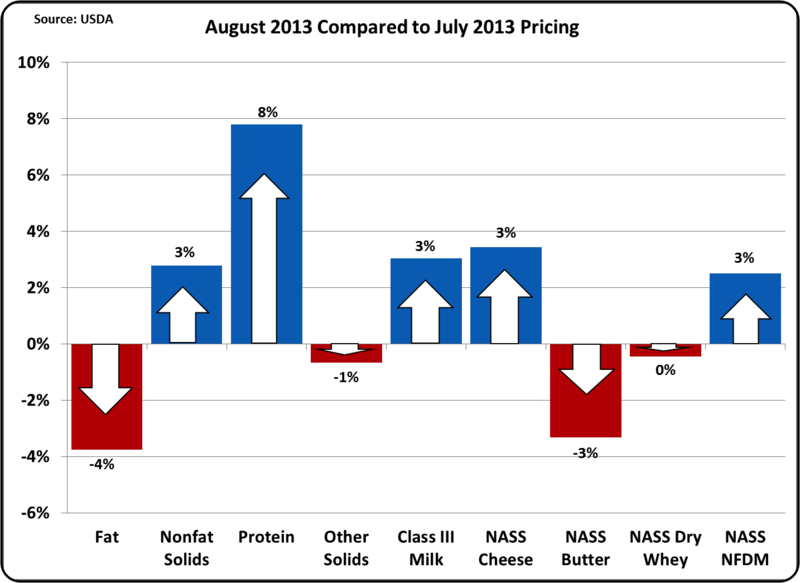 The Class III milk price was $17.91/cwt., a 3% improvement over the prior month. 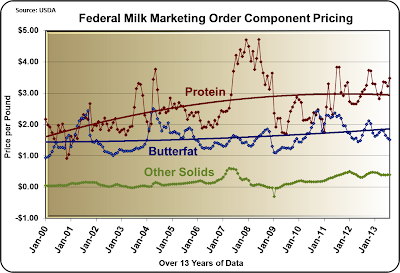 The butterfat price dropped to $1.51/lb., down six cents from the prior month. 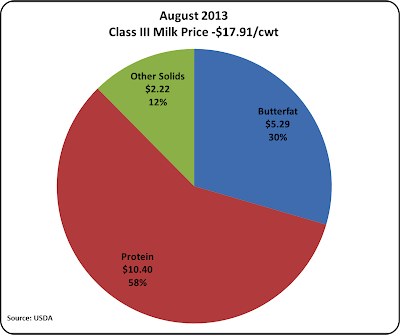 Milk protein however advanced 8% to $3.48/lb. based on an improved cheese price and a weaker butter price (click here for an explanation of this relationship). 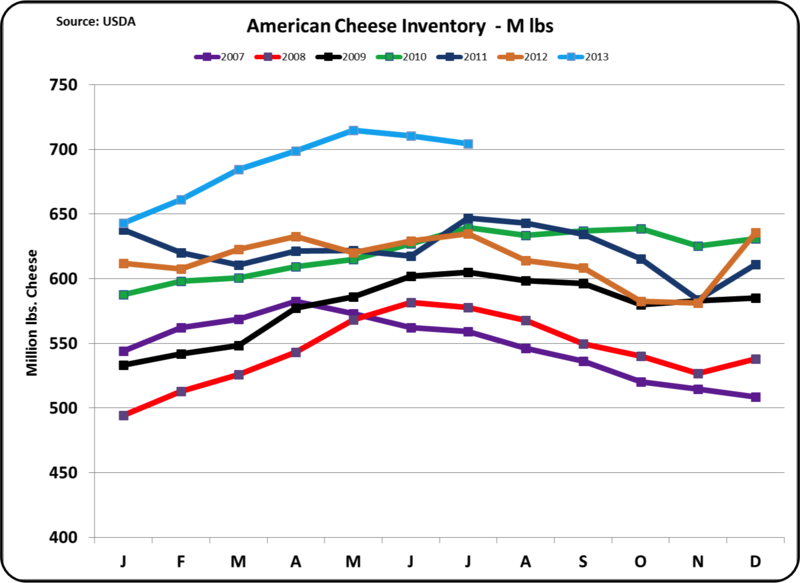 The increase in the price of cheese was surprising as cheese inventories remain well above historic levels. 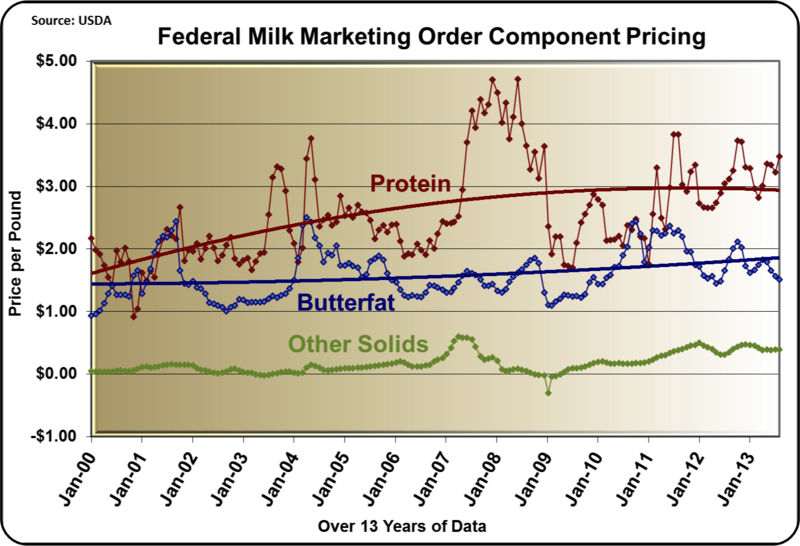 The three components that make up the Class III price are returning to the expected relationship of milk fat around $1.50/lb., milk protein near $3.50/lb., and the new norm for other solids of around $.50/lb. In terms of the relative value of each component, milk protein hit an all-time high making up 58% of the milk check. Of the $17.91/cwt. 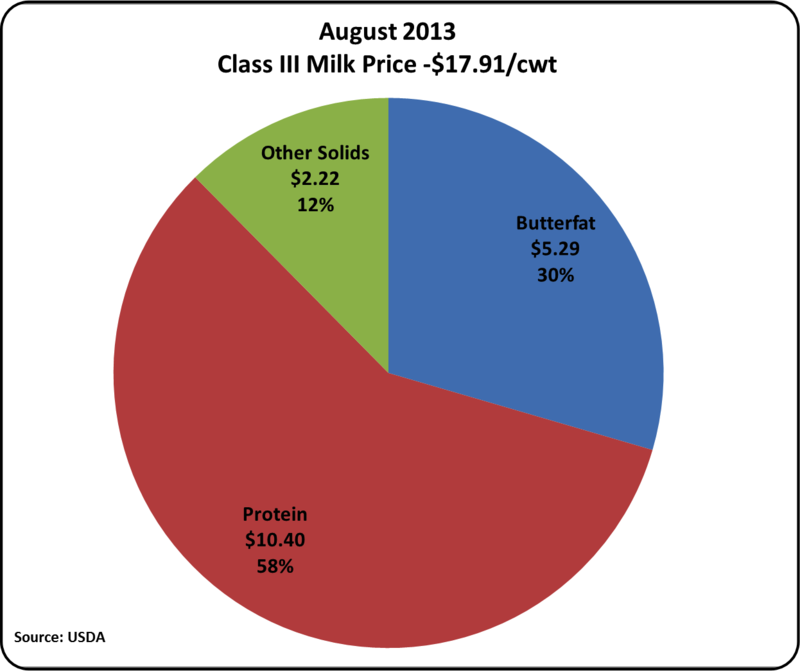 Class III price, milk protein contributed $10.40 based on the USDA standards of 3% protein, 3.5% fat, and 5.7% other solids. 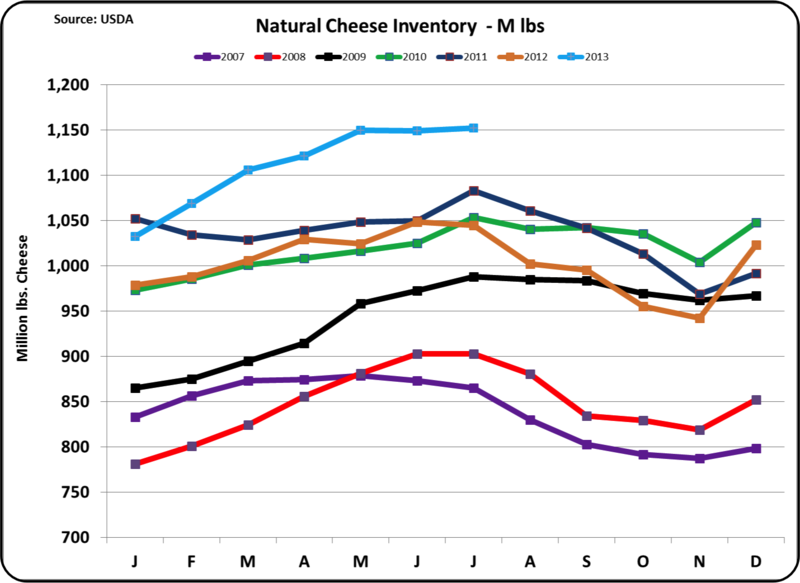 The remainder of this post will concentrate on factors that influence the price of cheese, which has a major impact on the Class III price. 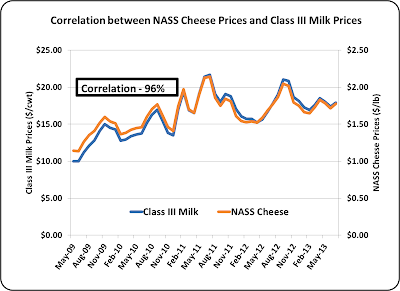 The relationship between the NASS wholesale price of cheese and the Class III milk price is shown below. The math behind this relationship is explained in a prior post to this blog. 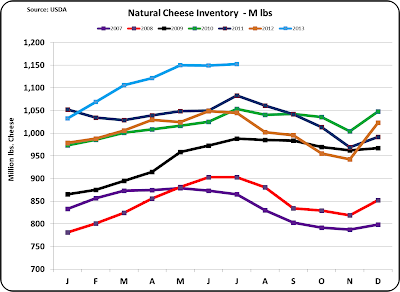 In spite of the excellent August price for cheese and the resulting excellent price for milk protein, there is still reason for concern. 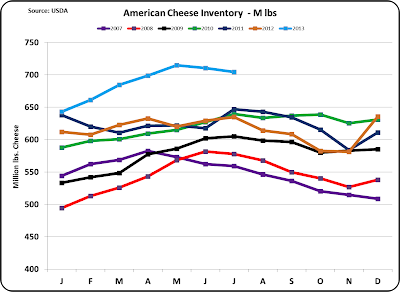 Cheese inventories are still very high and may have a future downward impact on cheese and Class III milk prices. The high inventory level discussed previously in this blog has not significantly changed or improved as of the end of July. 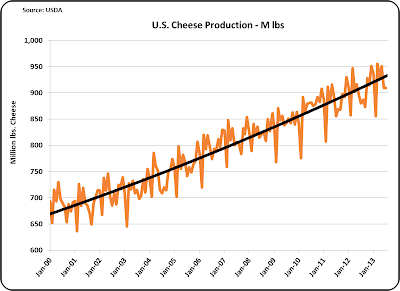 Cheese production has continued it's long term trend of growth as shown below, but cheese domestic consumption and cheese exports have lagged vs prior growth rates. (See the April 7, 2103 post to this blog for a discussion of domestic consumption.) 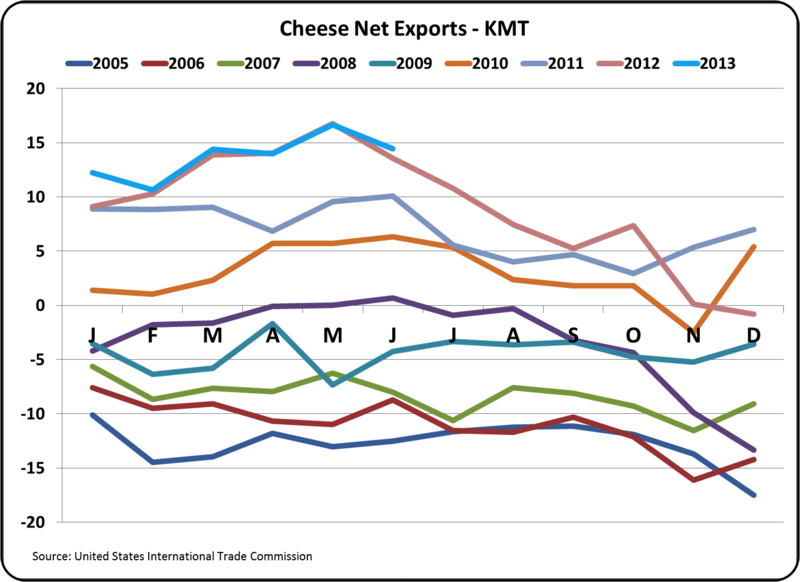 Cheese exports are growing, but nowhere near the level of increase in prior years. 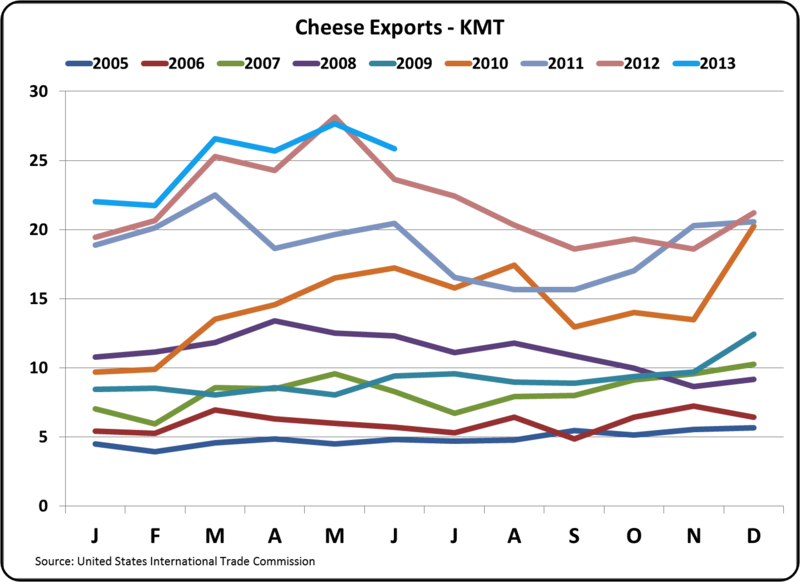 The United States Dairy Export Council releases a monthly report on dairy exports. 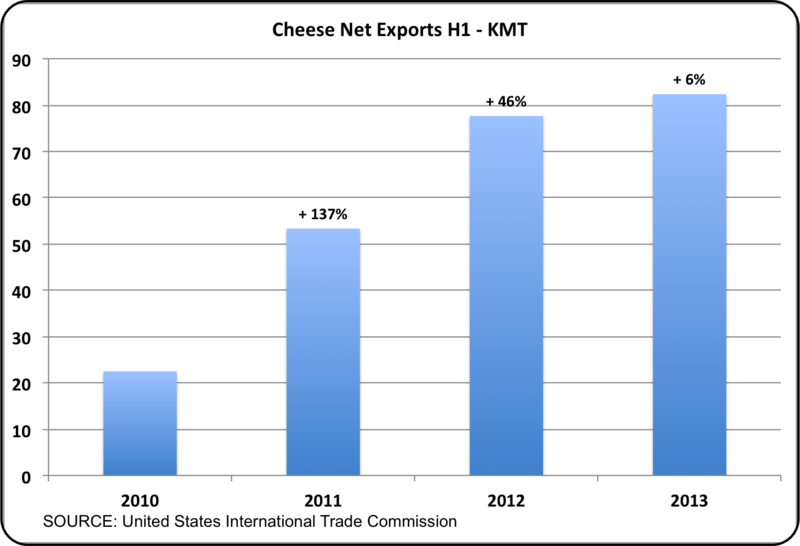 They have done an excellent job in growing the U.S. dairy industry exports. 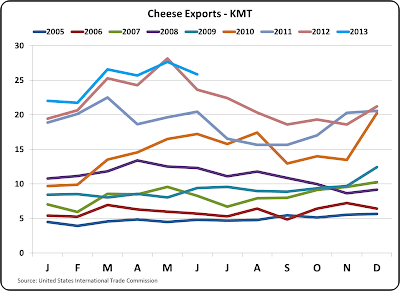 However, the gain in exports in 2013 has not kept pace with prior years, especially in cheese exports. In their report for H1 of 2013, they summarize the USD export growth at 16% vs. prior year. 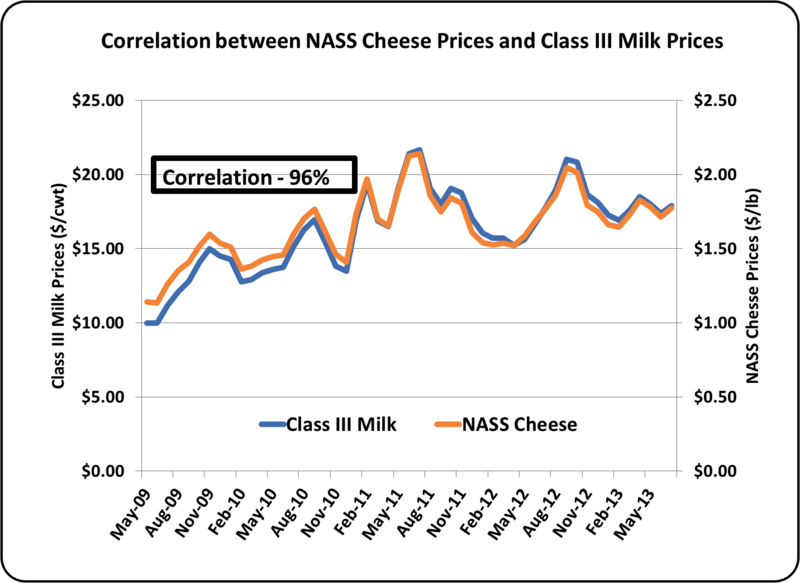 However, the most important component for milk pricing, cheese, grew only 6% in volume, a significant drop from prior years. 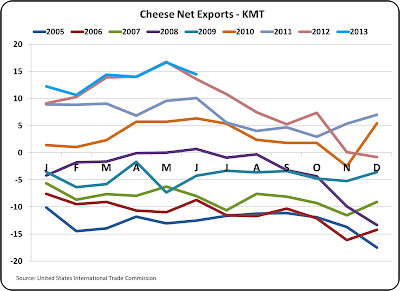 Cheese net exports (exports - imports) show almost no gain in H1 2013 over H1 2012. 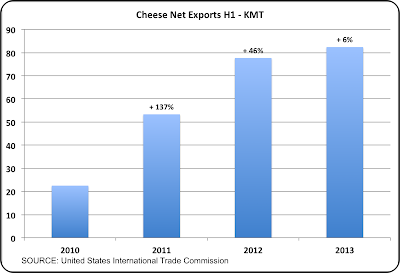 The chart below shows the H1 growth in net exports (total exports - imports) over the last three years. The annual growth in 2011 was 137% and for 2012 it was 46%. The growth of 6% in 2103 is a huge fall from the prior years. The change to almost no gain year over year was not expected as the industry produced to a level that was suggested by the past gains. 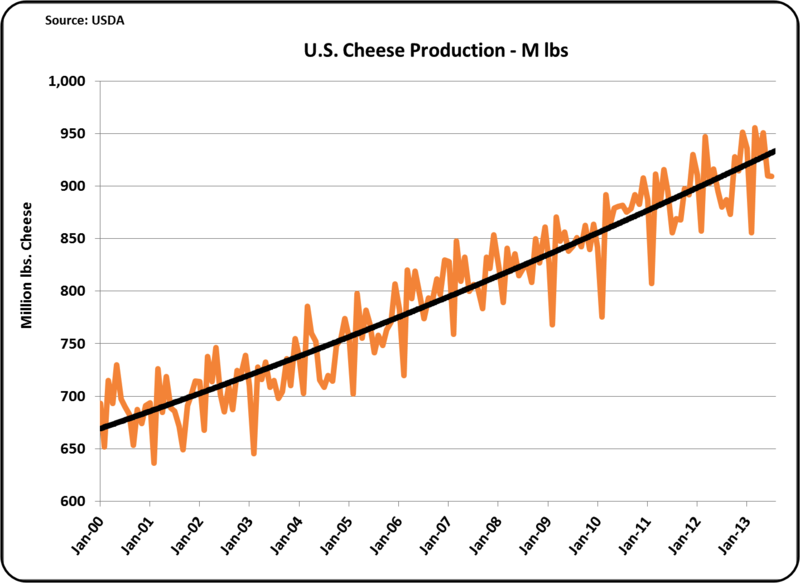 Increases in cheese manufacturing capacity require long term planning, with capital expenditures, supply contracts, and labor hiring and training. That momentum is hard and expensive to quickly change. Probably only lower cheese prices, and therefore lower milk prices will force a reduction in cheese production. The alternative is to wait out the lull and endure the lower prices until demand does increase to the current level of production capacity. Either way, lower prices do seem to be on the horizon.